Dom Ruinart Rosé is always a unique blend. Composed of 80% Chardonnay and 20% Pinot Noir vinified as red wine, it has the character of a « blanc de blancs rosé ». Don’t be misled into thinking that the high proportion of red wine means this wine has a deep colour. The cellar master vinifies the Pinot Noir, not looking for colour or tannins, but for aroma. Dom Ruinart Rosé is undoubtedly one of the most delicately aromatic rosés in existence. This constantly classic Champagne is defined by its layers of minerals laced with smoke. A pink Champagne does not evolve at the same tempo as red wines of the same age. Flavours of the East draw you in with their complexity of exotic spices. Refined wild sea rose and a hint of dried rose petals hover on the surface of the Champagne and unfurl on the palate. 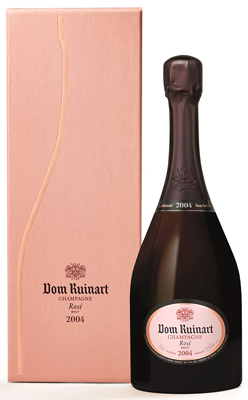 Dom Ruinart Rosé 2004 is a pretty pink colour, with delicate coppery reflections which again are almost pink. The nose is tenderly aromatic, characterised by very ripe, sweet red fruit notes: raspberry, red currant and wild strawberry jelly. This aromatic palate is completed with the fresh floral notes of roses, and a slightly mineral note (wet rock). The 2004 vintage has a clean, crisp imprint which marks the palate, providing a cutting freshness to the finale. The register is always marked by red fruit and is completed by fully ripe citrus fruit: blood oranges and mandarins. Just like the Dom Ruinart Blanc de Blancs 2004 on which this vintage is based, a low dosage enables the purity and complexity of Champagne’s best grand crus to be highlighted. This fine rosé champagne is based on the Chardonnay Grand cru and will accompany both a seafood theme (salmon tataki, marinated tuna, etc.) and a turf-based dish (poultry and veal in particular). With several years of additional ageing, it will pair with the same ingredients but with more intense, spicier and warmer flavours. Following the trend of the previous ten years, 2004 showed itself to be a rather hot, dry year, without any particular accidents or “hiccups”. After a mild winter and a pleasant spring, the gloomy summer and a significant load in the vineyard raised fears of a fragile ripening. This was not to be the case. A dream September (+2°C and + 20% sunshine compared with the average, with 80% less rain) lead to a completely healthy harvest, with excellent analytical parameters. Since 1729, Ruinart has been creating its champagnes in the same spirit of innovation, purity and timeless elegance – it is this ‘Signature’ which has become a characteristic trait of the oldest champagne house. Full bodied, supple and extremely smooth, Ruinart champagnes combine delicacy, and subtle freshness. The Ruinart taste is a radiant alliance of the distinctive flavours of the predominant chardonnay – the elegance of the grapes from the Côte de Blancs and the character and body of those from the Montagne de Reims. Inspired by Dom Thierry Ruinart, founder of the House, the Dom Ruinart cuvees are made from the finest Chardonnay wines.